"Hairy Maclary felt bumptious and bustly, bossy and bouncy and frisky and hustly". Hairy Maclary, everyone's favourite dog, is busy chasing and hustling all the neighbourhood cats from Slinky Malinki to Pimpernel Pugh. But when he comes face to face with Scarface Claw, the toughest tomcat in town, it's Hairy Maclary's turn to be bustled, rustled and hustled! What I like about it: My absolute favourite thing is that this is Hairy Maclary repackaged for the digital generation. 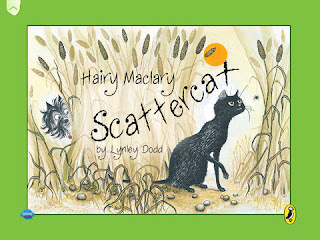 Lynley Dodd's books have always been adored by kids and this book app means children can access the story via the iPad. I've always loved the rhyme, the rollicking rhythm and the gently humorous illustrations of the Hairy Maclary stories, and I was pleased to see the book app retains those features, while adding more. The developers have included several ideas to enrich the story for its digital life. Kids can record themselves reading it, or ask a favourite adult to do so. There's a paint option where kids can colour the pages. Touch different parts of the illustrations to hear character 'voices'. You'll also find some nifty learn-to-read features. I admit to being initially taken aback by the narrator's accent. Not the Kiwi voice I'd expected, but a scottish burr that quickly suited the story and brought it to life for me. At the time of writing this review, the Hairy Maclary, Scattercat app was free from iTunes, today $Au5.49. And if the print version of the book seems like an ideal companion for the app, check it out on Penguin Australia's website. There's lots to explore on the Hairy Maclary website, including resources for a party or library event. Yes, it was free when I got it too. I usually post to OZTL when I see good free apps - so many librarians doing it tough with zero money for books or apps. Tracy, as I said above, it was free when I got it but not currently. Keep an eye on it via something like Apps Gone Free though, in case it goes free again!